Ronda Rousey is out first to kick things off. Natalya is out next. 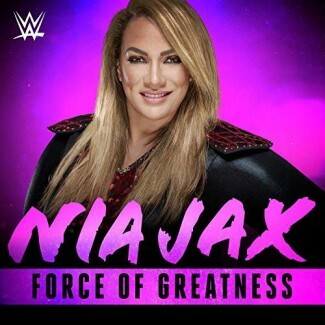 Nia Jax is out first for her team. Tamina Snuka is out next and they head to the ring together while Jax’s music continues. The bell rings but out comes The Riott Squad’s Ruby Riott, Liv Morgan and Sarah Logan with a table. This distracts everyone, allowing Jax and Snuka to strike. They end up pulling Rousey out of the ring and double teaming her, destroying her and sending her into the steel ring steps. Natalya tries to fight off The Riott Squad but they triple team her on the other side of the ring. They set the table up on the floor and bring Natalya in to slam her from the apron but Rousey slides into the ring and comes to make the save. Jax and Snuka stop Rousey and attack her. We also see what happened to Ronda Rousey and Natalya earlier tonight. 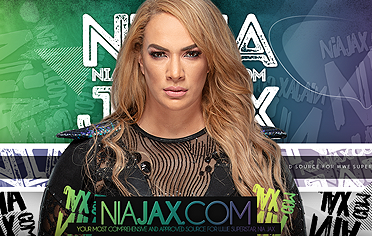 Charly is backstage with Tamina Snuka and Nia Jax, revealing that Ember Moon will be Natalya’s replacement in tonight’s main event. They pick on Charly some and Jax says she’s going to rearrange Ember’s face like she did with Becky Lynch. Then they’re going to isolate Rousey as Jax continues her path to get back what is hers – the RAW Women’s Championship. 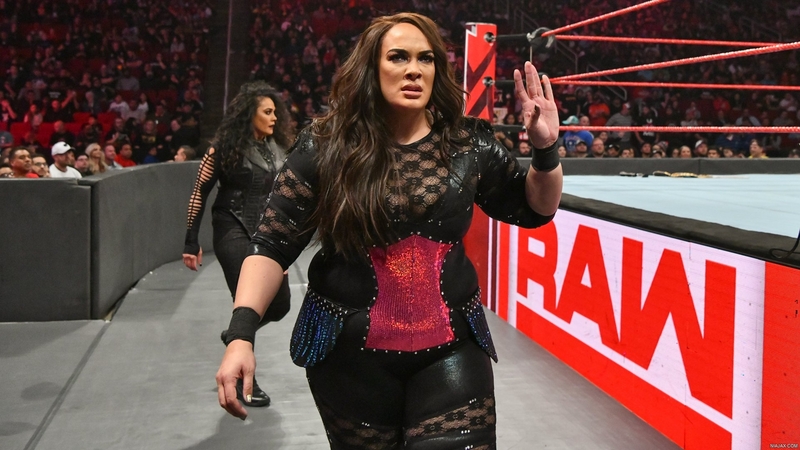 We go to the ring and out comes Nia Jax and Tamina Snuka for tonight’s main event. Ronda Rousey is out first for her team. Rousey hits the ring, staring her opponents down as they exit. Rousey turns to wait for her partner Ember Moon as the music hits. Jax and Snuka enter the ring to beat her down from behind. Moon rushes the ring and flies at Jax with double knees. Moon leaps out and takes Snuka down now. Rousey runs the apron and jumps down to the floor at Jax, taking her back down. Back from the break and the match is underway. Jax tosses Moon and talks some taunts Rousey. Snuka tags in and decks Moon, then rocks her with a right hand. Moon counters coming out of a move. Rousey tags in. Rousey nails Snuka and knees her as Moon tags back in. Moon drops Snuka on her face and covers for a 2 count. Moon flips into the corner with the big right hand to Snuka. Jax comes in and distracts Moon and the referee. Moon turns around to a big kick from Snuka for a close 2 count. Snuka knocks Moon into the corner and works her over. Jax tags back in and hits Moon in the gut while Snuka holds her. Jax drops Moon with a headbutt, then mocks Rousey. Jax and Snuka keep control until Moon counters and sends Jax to the mat. Jax ends up knocking Rousey off the mat with a cheap shot. Ronda comes back up but Jax and Snuka double team Moon, taking her back to their corner. Snuka slams Moon in the corner and keeps the attack going. Snuka accidentally knocks Jax off the apron to the floor. Moon goes for a tag but Snuka runs over. Moon with an enziguri. Rousey finally gets the hot tag. Rousey rushes in and unloads with clotheslines to Snuka. Rousey with knees and more strikes. Rousey orders Snuka to tag Jax in. Jax tells Rousey to come get her if she wants her. Jax comes in and taunts Rousey then immediately tags Snuka back in. Fans boo Jax. Rousey yanks Jax into the ring. Snuka is legal and she comes i but Rousey hits her with body shots into the corner. Rousey with a flying elbow. Rousey with another big takedown for a close 2 count as Jax makes the save. Moon comes in and they take Jax down with strikes. Snuka rolls Rousey up from behind for a close 2 count. Moon ends up hitting The Eclipse on Snuka. Rousey grabs Snuka’s arm and drops her into the armbar. Jax looks on from the floor as Snuka taps out for the finish. After the match, Rousey and Moon stand tall as Rousey’s music hits. We go to replays. Jax backs up the ramp as Rousey stares her down from the ring, holding the title over her shoulder. RAW goes off the air.